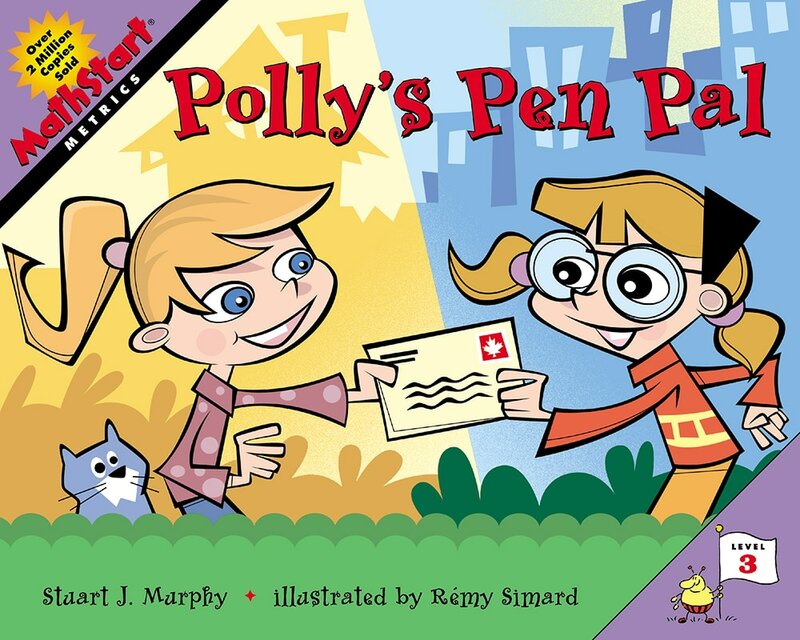 Polly's new pen-pal, Ally, lives in Montreal, Canada, where they use the metric system. Polly and Ally have lots in common: They both have cats, like the color purple, and are just about the same size and weight. But when Ally writes that she is 125 centimeters tall, Polly needs to ask her Dad for help to figure out how tall that really is. Dad uses a baseball bat about 1 meter—100 centimeters—long as a reference, and shows Polly that one centimeter is about the width of his little finger. Dad helps Polly figure out grams and kilograms, and meters and kilometers, also by using every day references she can relate to. The use of rough equivalents in terms of familiar objects and distances helps kids become familiar and comfortable with the metric system.